When you're planning on spending the entire day running from discussion panels to talks by television stars, only to be interrupted by the never-ending wait in the autograph line, you need to start the day with a good meal. And end it, also. Fortunately for the attendees of Shore Leave 37, the Hunt Valley Inn provided the fuel for such endeavors in the form of an all-you-can-eat buffet. There are rumors that management is now reconsidering the wisdom of that choice. It was $24 for dinner and somewhat less for breakfast, and there is little doubt I received my money's worth. I only ate two meals per day and I believe I've gained about five pounds over the course of the weekend. Never were less than three plates used, and on at least on happy occasion, a fourth was required. I believe there is a possibility that I used a second plate to get the potatoes and some more fruit. There was probably something else on the plate, too, but I can't remember. Maybe it was bacon. Yes, forced, I tell you! With more coffee, of course. 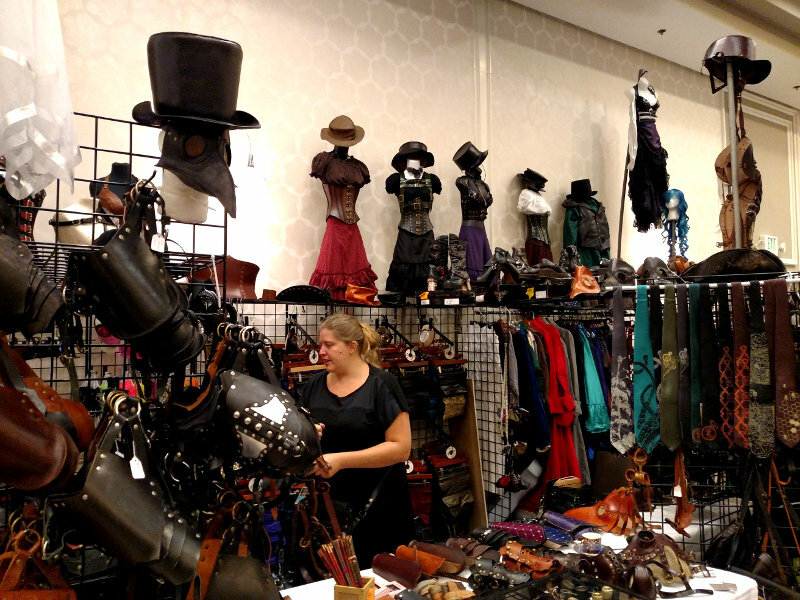 This is Lady Heathers Fashions, with all sorts of stuff for cosplay. They also do custom leatherwork. Around this time, I got a John Barrowman autograph for my brother. Get a good cover. Look at covers you like and find out who made them. Don't be afraid to redo the cover if it doesn't work. Build a query synopsis - 1 to 2 sentences with plot and ending. You can check Queryshark for help. And query only one book at a time, don't bombard them with a whole series even if you have that in mind, No more than about 200-250 words. Check out W. B. Thomas' Guide to Query Letters. 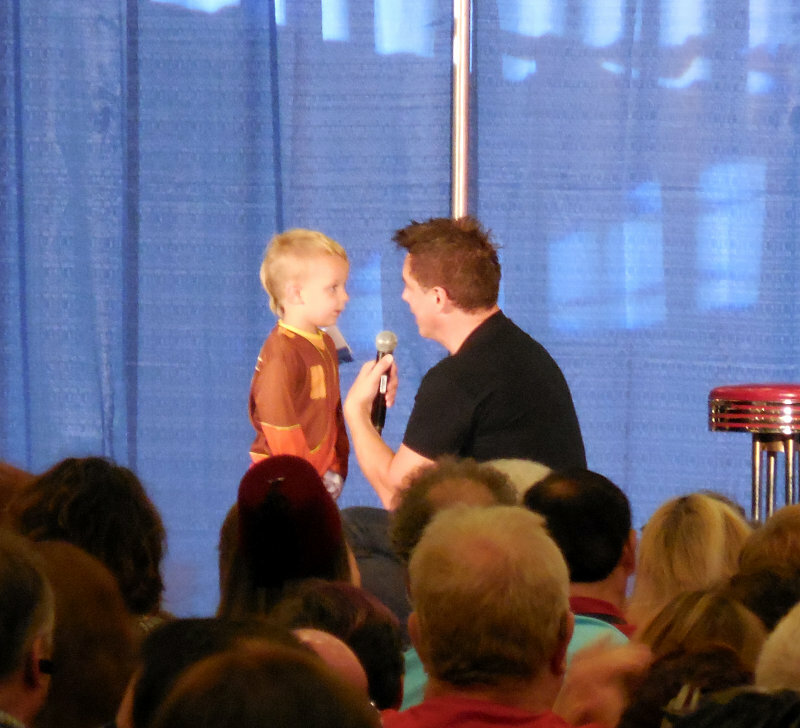 I got out in time to see the last part of John Barrowman's Saturday talk. 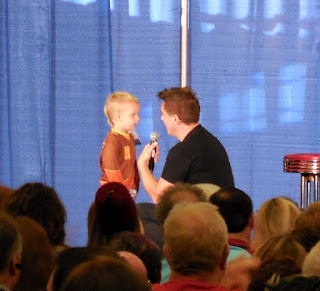 This is John clowning around on stage with a boy from the audience. After that, I caught the last part of Roger Cross speaking. I took several picture of him, but not one came out sharp. BTW, there isn't any "travel time" built into the schedule, so just as one event ends the next is starting. That's a bit irritating as the events aren't right next to each other, and with all of the people crammed into the halls it takes time to get from one area to another. The complaint database at Writer Beware is confidential. An agent requires no certification. If an agent says they are certified, distrust them. Some valid agents will charge a fee (usually they will read the entire manuscript if they do). The biggest problem is amateur agents. The best situation is to find an agent moving away from an established company. Use AgentQuery to check for agents - who, what agency, sales. Smaller presses should specialize - they shouldn't try to cover every genre. After the workshop, I made my way into the main auditorium (the Hunt Room and the Valley Room joined together) to see the folks from Defiance (Jesse Rath, Jaime Murray, and Tony Curran). Here are close-up pics (about the best I could do without a tripod). Somewhere in here, I got to talk to and shake hands with David Nykl. After that, I got into the autograph line with my group. I got an autograph from Tony Curran on a picture from the Dr. Who series where he played Vincent Van Gogh. Then it was time for dinner. Think of dinner as breakfast except there was roast beef, fish stuffed with crab meat, and delights of that sort. And, of course, dessert! I've become quite good at waddling. With the day coming to an end, we relaxed with an adult beverage (only one), then went back to our rooms and turned in. P.S. There's more to come. I'll try to get it posted when I can. Farpoint is trying to raise money to enable them to bring more actors and actresses from popular shows to their convention. This can be expensive. If you are interested, please listen to the message from Tim Russ (Star Trek Voyager) below, then check out their kickstarter page for more info. Click HERE to go to the Farpoint Kickstarter.